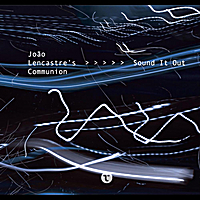 Third release by Joao Lencastre's Communion presents many different moods, all played with great energy and interaction. I've known all the musicians on this recording for a long time and some of them are my best friends. They are also some of my favorite musicians in the world with a strong personality and their own voice on their instrument, while truly being masters of improvisation. We have been playing a lot of the tunes on this album for a long time and I find it always surprising that, depending on how the room, the crowd and the musicians respond that day, we get entirely new versions of the same songs which take us to new places every time. The one thing that is constant is that everyone is just reacting and letting all their emotions flow in the moment.That's what I call sound it out. Joao Lencastre is a drummer/composer native from Lisbon. Started playing the drums at the age of 13 and he is now one of the most active and creative musicians on the Portuguese musical scene. He has played all different kinds of music, from avant garde Jazz to mainstream,Alternative Rock, Afro Beat, Reggae, Metal, World,Electronic/Dance, etc. Apart from Portugal, has also played in different venues around the world, including New York, Prague, England, Spain and Panama. Has played and/or recorded with David Binney, Bill Carrothers, Andre Fernandes, Mario Franco, Thomas Morgan,Jacob Sacks,Afonso Pais,Carlos Martins Carlos Barreto, Phil Grenadier, Andre Matos, Demian Cabaud,Leo Genovese,Johannes Krieger Benny Lackner, Nelson Cascais, Spill, Joao Paulo Esteves da Silva, Vojtech Porchaska, David Doruzka,Noah Preminger,Russ Johnson,Sean Conly, Tiago Bettencourt & Mantha, Blasted Mechanism, Jacinta, Cacique 97, Philharmonic Weed, among many others.